Klorane pioneer the use of natural, pure botanicals within a strict line of respectful, scientific conduct. Klorane develop products that are formulated with plant extracts whilst protecting the earth's beautiful flora. Just like your daily skincare routine but for your hair, Klorane is gentle yet very effective at treating your hair concerns. 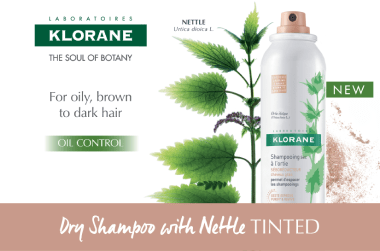 Inspired by the beauty and natural ability of plants around the world to conquer the harsh environments they thrive in, whether your hair is dry and damaged, weak and brittle or requiring a renewed sense of balance, Klorane has a range to suit your needs. I do like this dry shampoo and it is very effective, but for the price I'm unsure I would continue to buy over a more economical brand. I'm not a huge dry shampoo user though - only when I'm desperate! So maybe I'm happy with something simpler for my occasional use? I like this is a shampoo but I wouldn't say it's volumising. I might try the conditioner with it and see if it's better. I have dry fine hair and this is a gentle but effective shampoo that doesn't weigh my hair down. I only notice the volumising effect when I blow dry my hair after, and it's just minimal, like a lightness rather than boosted roots.